The pieces in this series are transparent watercolor on archival paper. 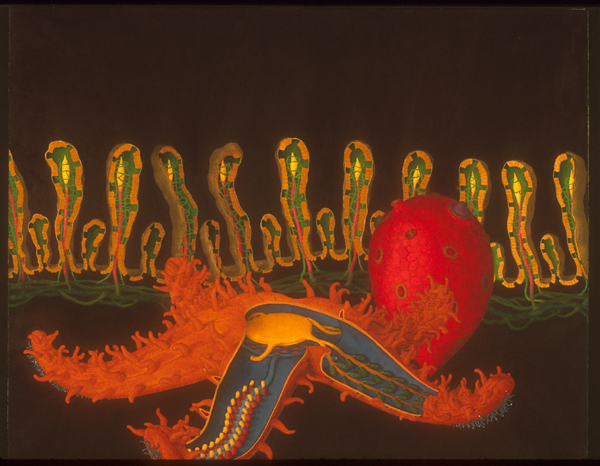 The subjects are zoological invertebrates and electron microscopic images. They were very satisfying to create. 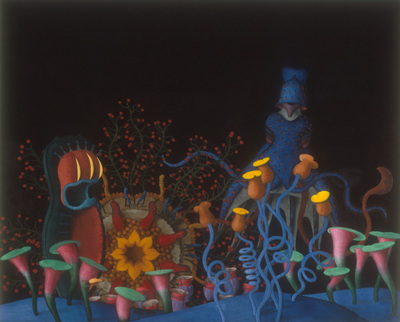 The large paintings took on average six months to create. 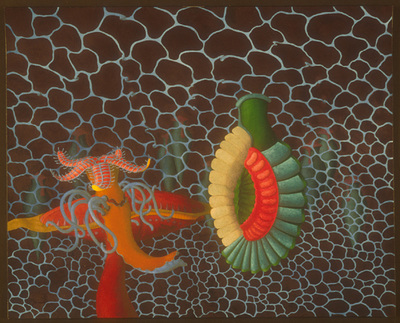 'Conducting a Symphony of Forms' 45" x 34" 1990. Not available. 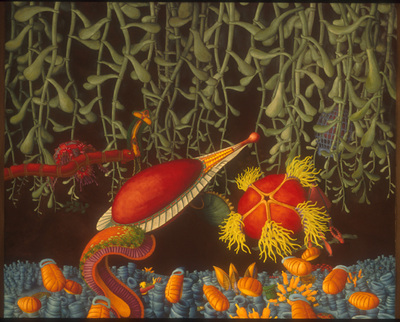 'View at the Ocean Floor' 45" x 54" 1987. Sold. 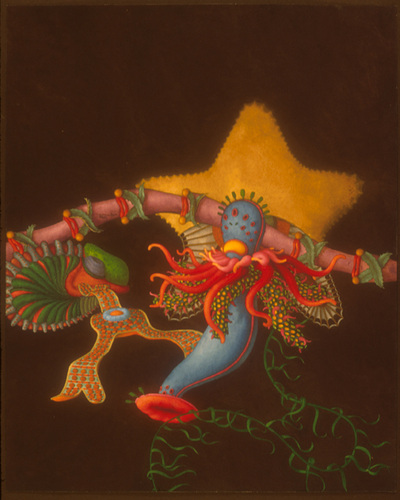 'Friends with Space between Me and an Icon' 19" x 24" 1988. Not available. 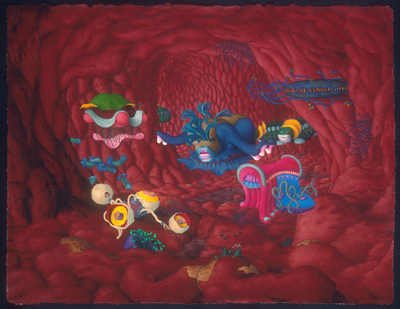 'His Transformation in My Environment' 19" x 24" 1988. Not available. 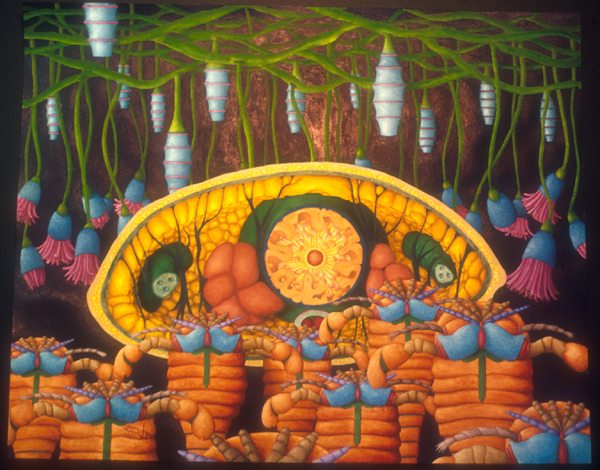 'Bell Tolls as New Seeds are Planted' 34" x 44" 1987. Available. 'Life in an Artery' 22" x 30" 1990 Available. 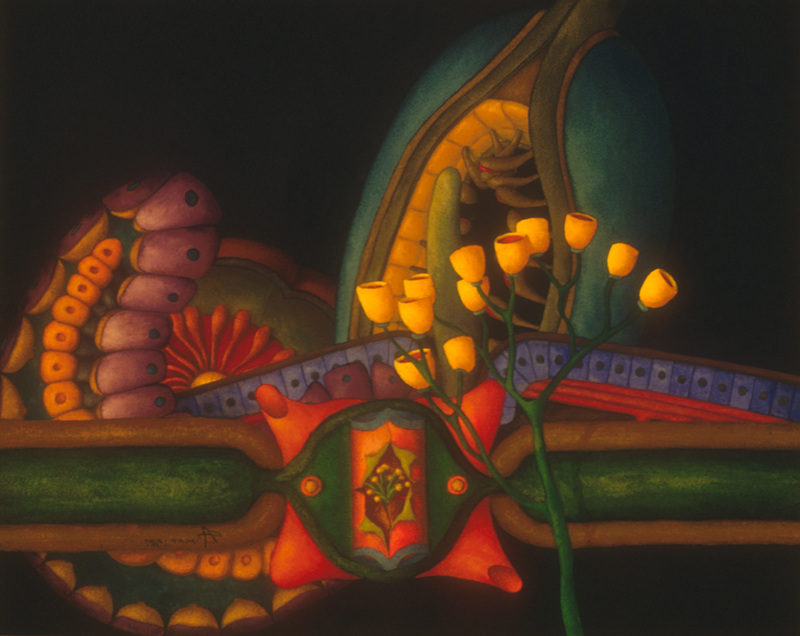 'The Rising Watercolor' 19" x 24" 1988. Sold. 'Heart in a Box' 30" x 22" 1988. Sold. 'Entering His Space of Quiet Celebration' 19" x 24" 1988. Available. 'Keeping an Eye on Pitchers and Patterns' 24" x 19" 1988. Not available. 'Indian Ocean Watercolor' 19" x 24" 1987. Sold. 'Floating Throne Watercolor' 19" x 24" 1987. Sold. 'View on the Other Side of the Fence' 19" x 24" 1987. Available. 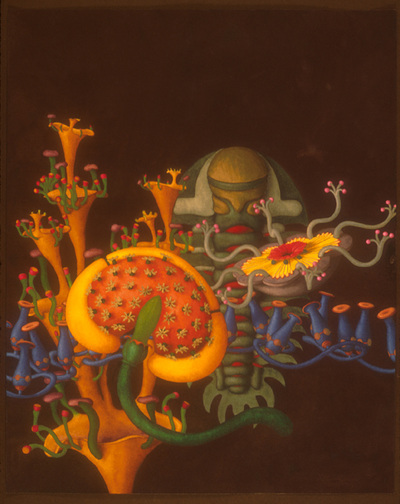 'Crimson Crown' 19" x 24" 1987. Sold. 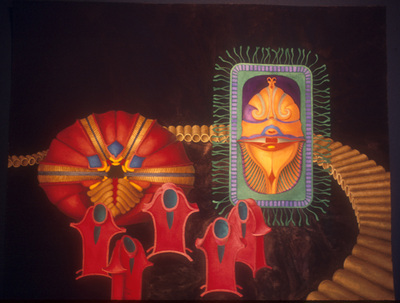 'A Choir with Overtones' 19" x 24" 1987. Sold. 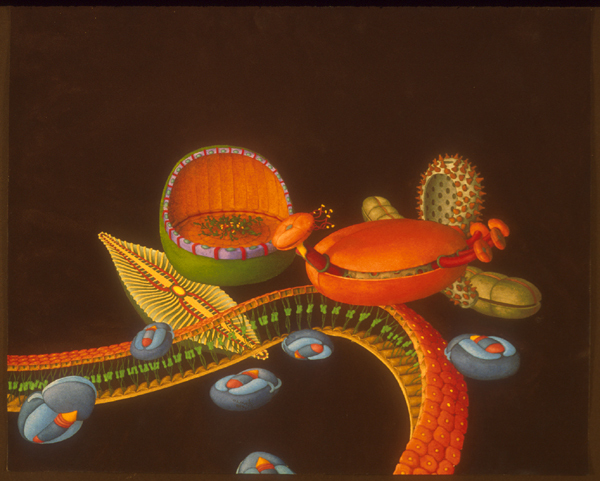 'Place Setting' 11" x 14" 1987. Sold. 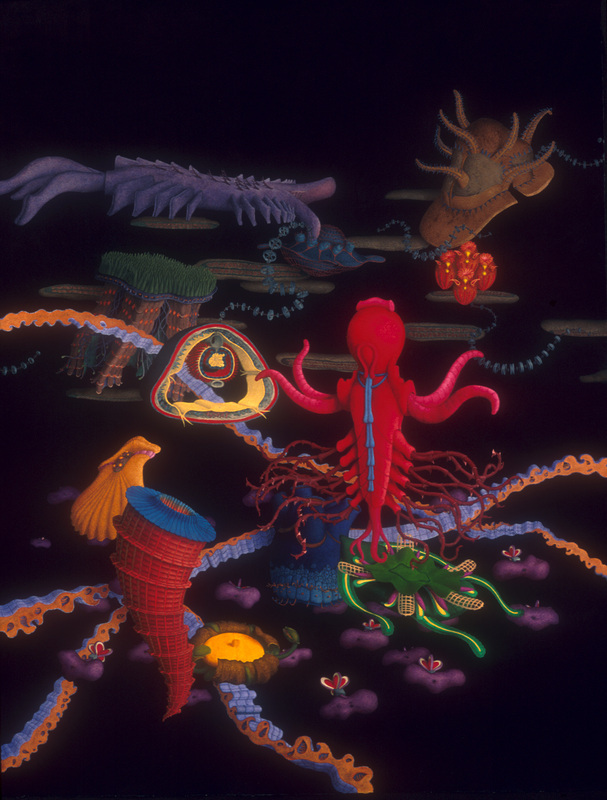 'Ocean Symphony, Male and Female' 19" x 24" 1986. Sold. 'Fresh Water' 11" x 14" 1987. Sold. 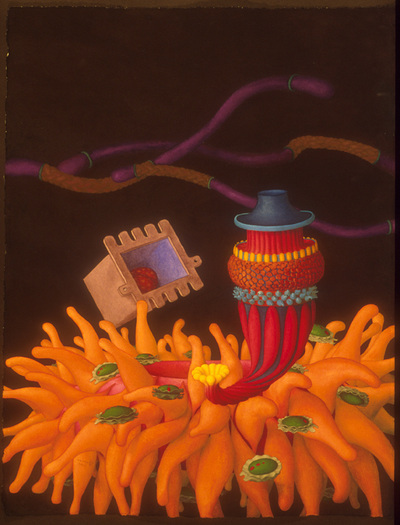 'Sushi Nest' 22" x 30" 1987. Sold. 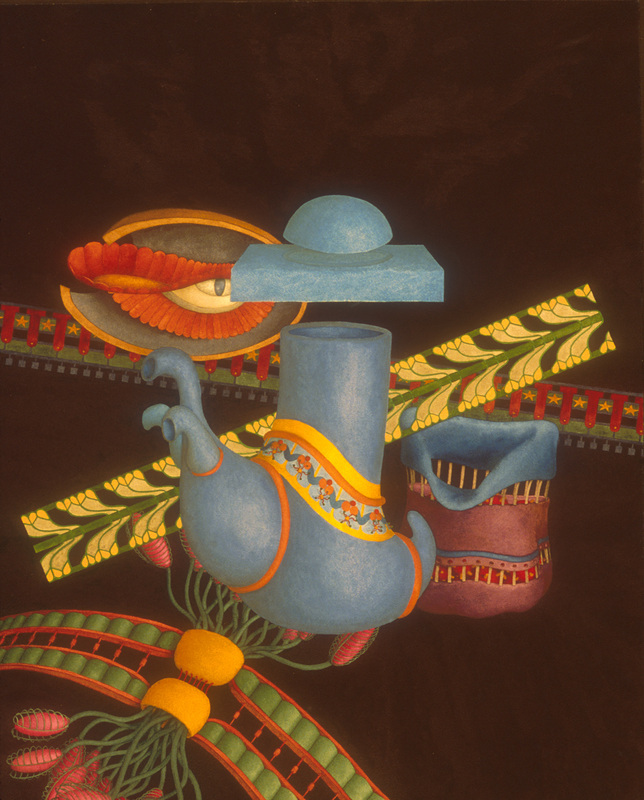 'Giving Someone Else the Foreground' 12" x 9" 1986. Not available. Recently I researched the identification of the species used in this series. 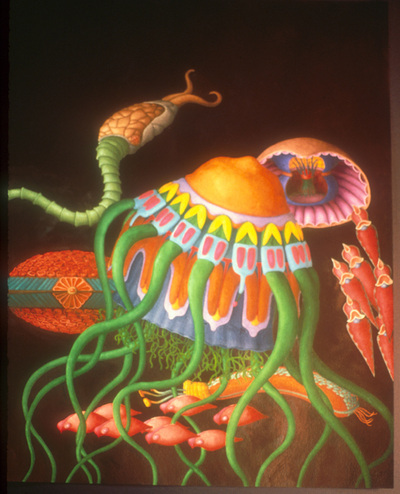 While "Art Forms in Nature", 1904, by Haeckel, was a major resource, I also used images found in numerous zoology text books. Much has changed in the nomenclature. 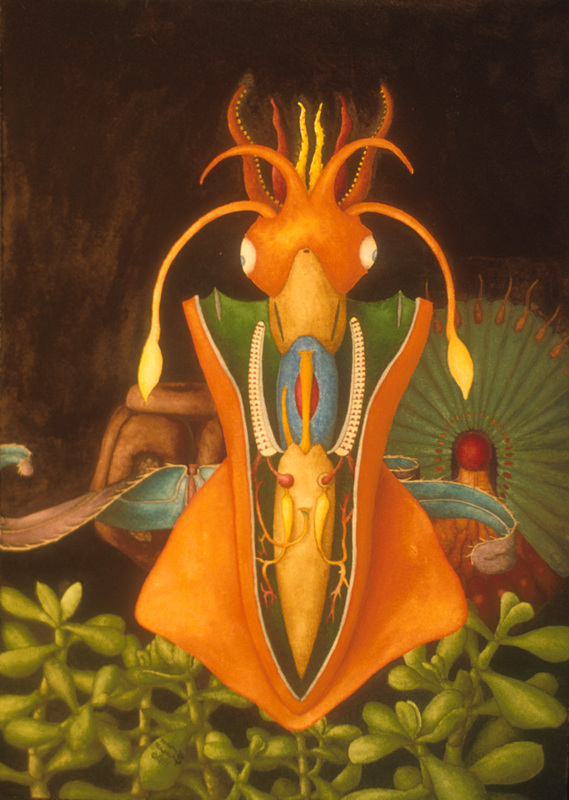 Consequently, it has proved impossible to trace some of the species names—at least when conducting a deep, wide search into current literature. 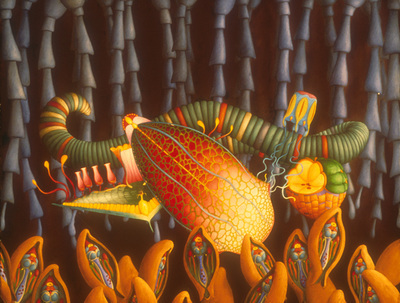 After updating the names for each invertebrate found, I borrowed the imagery techniques used in science text books by preparing schematics for each painting. 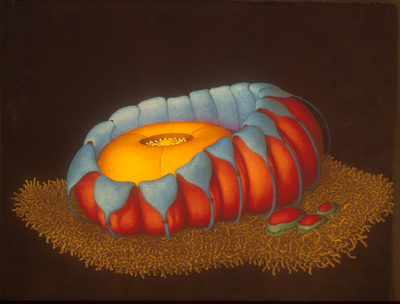 The sample below identifies the forms used in a particular painting. 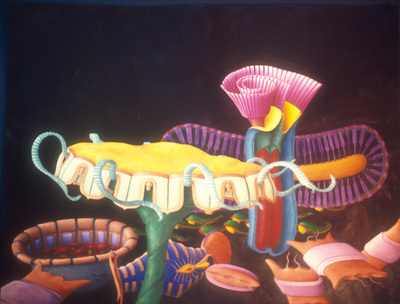 a. Longitudinal section of Homo Sapien small intestine (duodenum). b. Deutocystis modesta, an extinct Echinoderm. 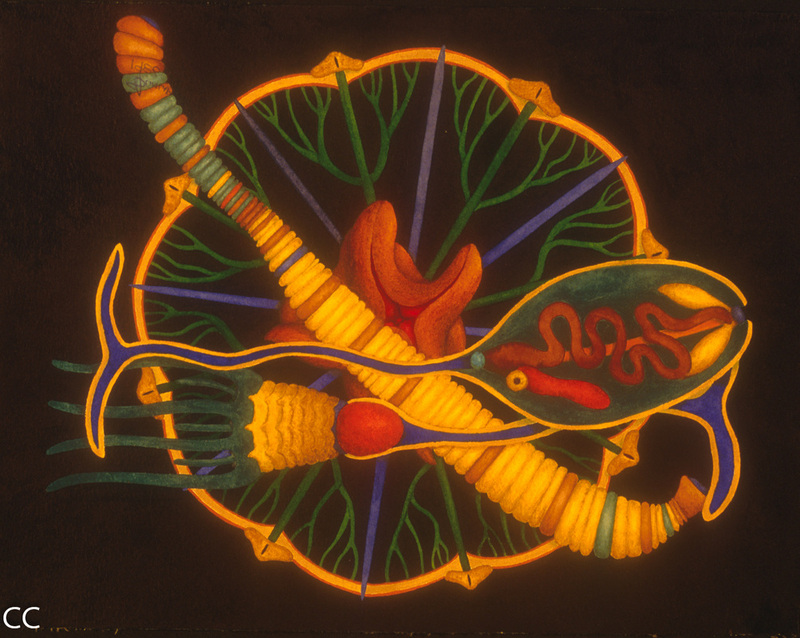 c. Sea star with five rays , probably Asterias rubens. 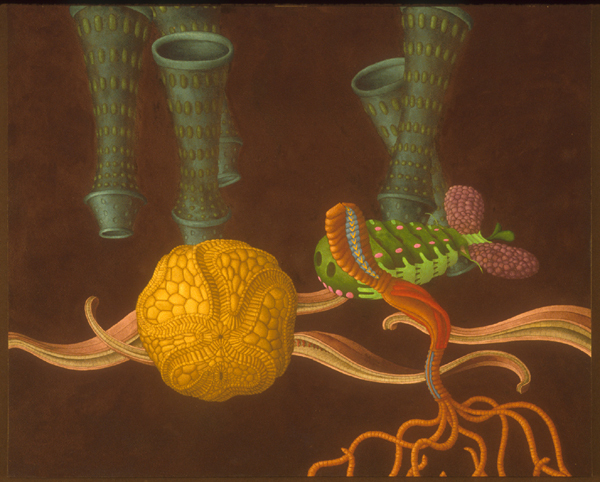 Modern biology, pg 420; green is digestive glands, the flesh tone are tube feet, the yellow is its annus while underneath this is the stomach.